Steven Land shirts will let your style shine through with a mens fashion dress shirt with french cuffs that has head turning magnetic power. Featuring style by the mile. Your wardrobe will quickly appreciate the welcome new look that you have adopted. 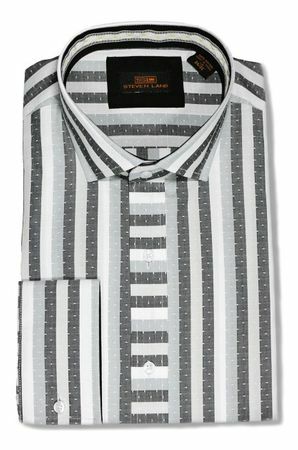 This Steven Land all cotton black stripe dress shirt features a spread style collar and french cuffs. Make some noise.